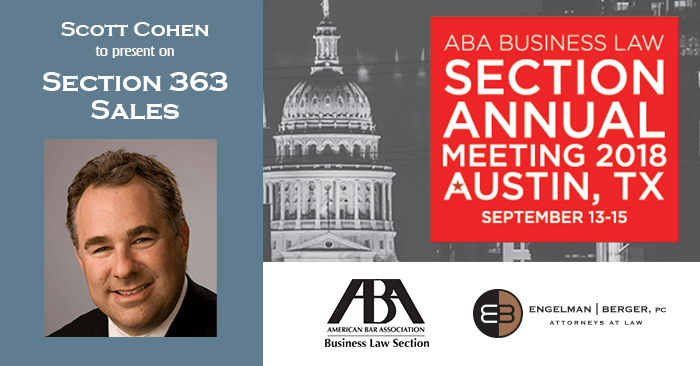 Scott Cohen, a shareholder of Engelman Berger, will be presenting at the American Bar Association Annual Business Law Section meeting in Austin, Texas. The event will be held at the Fairmont Austin Hotel from September 13-15, 2018, and will feature many great speakers. Scott, a member of the ABA, will be presenting on the topic of “Successor Liability in Asset Acquisition Transactions, Mergers and Acquisitions and Business Bankruptcy Committees.” During his presentation, Scott will present a comprehensive approach to analyzing and minimizing successor liability risk in asset purchase transactions through specific structural steps, due diligence and insurance strategies. This year’s ABA Annual Business Law Section meeting will feature over 80 CLE programs, presented by many leaders in all areas of business law. Those who attend will be able to connect with colleagues and learn at substantive sessions, as well as at hundreds of committee and subcommittee meetings. The meeting will provide a great opportunity for over 1,600 business law professionals from over 20 countries to network together.